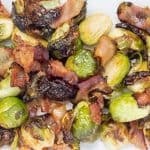 Crispy and tender, semi-sweet and savory Brussels sprouts with crispy bacon. In a medium mixing bowl - add olive oil, vinegar, maple syrup, salt, and pepper. Whisk together until fully combined. Add Brussels sprouts and bacon to bowl and toss well to coat evenly. Transfer sprouts and bacon to air fryer. Cook at 350 degrees for 8-12 minutes - depending on how crispy you like them. At least once during cooking, take out basket and toss contents around. Transfer sprouts and bacon to preheated 425 degree oven. Cook for 30-40 minutes - depending on how crispy you like them. Give them a good stir after about 15 minutes.